Traditionally, whenever any client application needs to invoke a web service it uses a proxy class generated using web service description language (WSDL). However there are certain situations where traditional approach is obsolete. This article discusses such situations where web service proxy is not much useful. Moreover this article demonstrates a way for invoking the web service without creating a proxy class. You can use example in this article to create a generic assembly which can be used with any web service without need for creating or using a proxy class. In this article you will see how to invoke web service without using a proxy class. Normally, whenever any client needs to access a web service, the first step is to create a proxy class. This proxy class can be generated using different utilities like WSDL.EXE or Visual Studio .NET using Web Service Description Language (WSDL). In VS .NET, when you add a new web reference, a proxy class is automatically created for your client application. This is a very simple way to access web service where WSDL plays an important role. However there are certain situations where you can not create web service proxy or proxy is not much helpful to implement the complete solution. In this article you will see a complete example which will demonstrate how to invoke web service without using a proxy class. In order to invoke web service without a proxy class, it uses WebRequest class and sends entire SOAP message as an HTTP request. From this article you will learn basics of WebRequest and its associated class and how to use them to invoke web service. Finally you will create an assembly which can be used with any web service without need of the proxy class. Fig 1. Various ways to invoke a Web Service. The attached sample code has following two different solutions. The WSInvoker assembly and TestClient console application. In order to run CurrencyHandler web service you need to declare it in the IIS. The WSInvoker assembly and TestClient are combined in one solution and can be run directly. Note that the attached code is slightly different than explained in this article and has additional comments and error handling. Why not Web Service Proxy? As discussed earlier, a web service proxy can be created using WSDL. WSDL defines a contract that lets a client invoke a remote service by describing the web service in terms the client understands. In .NET you can use proxy class with SOAP handlers to perform pre or post operations on SOAP messages, e.g. SOAP body encryption/compression. However for few clients it’s very difficult to write a code using SOAP handlers to implement custom SOAP formats. In such scenarios web service proxy is either obsolete or not much helpful. To overcome proxy generation problems and to invoke web service you can send entire SOAP message as an HTTP request. In order to do that the WebRequest class provides necessary infrastructure. Normally this approach has several advantages/disadvantages compare to the web service proxy class which is illustrated in following table. Easy to use with complex SOAP request which has SOAP body encryption/compression or non-standard WSDL formats. One time code to invoke any web service. Require additional coding for creating complete SOAP message. Better approach if you are changing your service description often. Requires complex SOAP Handler programming to extract and encrypt the SOAP body. May not work with non-standard WSDL formats. Need to create a proxy for every web services. No additional coding – just create instance of proxy and then invoke the web method. Every time client needs a new proxy for changed service description. With both approach, it is possible to make asynchronous web requests. The example in this article uses the WebRequest class and its derived classes for sending a SOAP message as an HTTP request. This section covers some basics of the WebRequest and its derived classes. The WebRequest class is the abstract base class which makes request/response for accessing data from the Internet. In order to make request to a web server it uses URI (Uniform Resource Identifier). Since this class is abstract class, the actual behavior of instances is controlled by the derived class. This class can be derived depending on what type of protocol (e.g. HTTP/FTP) you want to impalement with a web server. For example you can derive this class in the HttpWebRequest class to perform HTTP specific communication where as it can be derived in the FileWebRequest class to perform file transfer operations. Note that the actual behavior (HTTP or FTP) of WebRequest instances at run time is determined by the descendant class returned by WebRequest.Create() method. Since example in this article sends SOAP message using HTTP, you'll see how the HttpWebRequest class can be used to communicate with a server. The HttpWebRequest class supports properties and methods defined in WebRequest class. In addition this class also has its own specific properties and methods which can be used to communicate with a server using HTTP protocol. In following section you'll see some information on the HttpWebRequest which is specific to our example. This will help you to understand the code easily. This is overridden property from the WebRequest class. This property gets or sets method for the request. The request can be POST or GET. In our example this property is set to POST since we are posting the data to a web server. This is overridden property from WebRequest class and gets or sets the value of the Content-type HTTP header. This property determines the media type of the request. Since the web service request is SOAP envelope XML, this property is set to "text/xml”. In our example, the SOAPAction HTTP request header field can be used to exactly identify the operation on which service is being invoked. The value of the SOAPAction header provides a hint about how SOAPAction can be used and should be a URI identifying the “extended intent”. The format of the SOAPAction header to be the service namespace, followed by a forward slash, followed by the name of the operation, or urn:Example/sayHello. The GetResponse() method is overridden from the WebRequest class. This method sends a request to an Internet resource and returns instance of a WebResponse. However if the request has already been initiated then the GetResponse() method completes the request and returns instance of a WebResponse. This method is WebResponse base class method and returns the data stream from the Internet resource. It is necessary to close the connection and frees system resources once the client receives response from the Internet resource. You can use either WebResponse.Close() method or Stream.Close() method to close the connection. The CurrencyRate interface, which takes country code and returns currency rate against US dollar. This interface eventually calls CurrencyRateForUSDollar function which performs currency conversion. The ProductPrice interface takes product code and country code and returns price of a product against US dollar. /// The Converter service provides currency conversion services. /// code. If country code is not present then this method returns -1. In above example, the CurrencyRateForUSDollar() function performs currency conversion for only four countries with fixed currency conversion rate. To create WSInvoker assembly, create a new assembly project named ‘WSInvoker’ in VS2003 and rename default class Class1 to ‘Invoke’. Add the following namespaces which are require to perform HTTP post and to handle request/response streams. Next change the default constructor of Invoke class as shown below. The constructor accepts web service URL which is used for sending SOAP request. /// Constructor for Invoke class. The SendSoapMessage method creates necessary objects required to post a request and to get a response from the web service. 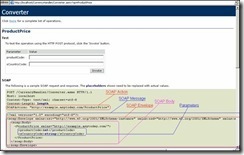 The WebRequest object instance is created using the Create method and web service URL. As discussed earlier, the WebRequest is an abstract class that can be used to create an instance of the HTTPWebRequest class. Next set properties for Method, Content Type and add SOAP Action in the header. The SOAP message then converted in to stream using StreamWriter object. The GetRequestStream () method initiates a request to send data to the Internet resource and Write() method actually writes stream to underlying HTTP connection. // 3.0 make the request and get the response. Further the WebResponse instance is used with GetResponseStream () method to read the response stream. Finally the stream is converted back in to string to get XML formatted web response. Once you complete coding compile the code and create WSInvoker assembly. Since we are posting SOAP envelope as an HTTP Post, consideration of using SOAP handlers at client side is not applicable. SOAP handlers at client side are useful when you use proxy. SOAP Handlers are used to perform additional processing on SOAP envelope (e.g. SOAP body encryption, inserting SOAP header etc.) However with HTTP post approach we have full control on SOAP envelope and therefore it easy to use direct HTTP post instead of SOAP handlers. Note that SOAP handlers at server side won’t affect if you use any method for invoking web service. To test WSInvoker generic assembly we need to create a web service client. Note that programming for web service client using direct HTTP module is different than using web service proxy. With web service proxy you can easily invoke web service by using proxy instance and web method name. However the client for invoking web service using direct HTTP call requires a complete SOAP message. In this section you will see how to create a client application which will use WSInvoker assembly to invoke web service using HTTP post. To start create TestClient console application in VS 2003. Rename the default Class1 to Tester and add reference to WSInvoker assembly. 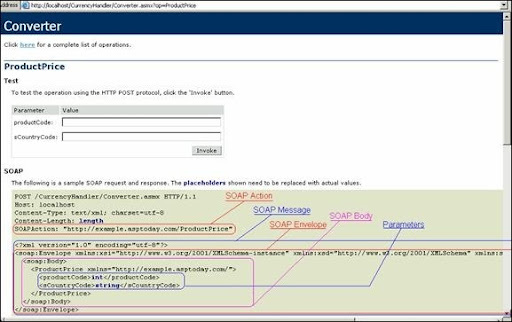 While using HTTP post method you need to send complete SOAP message to web service. However most of SOAP message is constant except the SOAP body, which changes according to web method and parameters. Therefore in our example we have declared most of the SOAP message part as constant strings. In the following code, the SOAP_START string has beginning of the SOAP message whereas SOAP_END has the string which is required to complete SOAP message. The SOAP body is dynamic and will be seated within SOAP_START and SOAP_END strings. Since web service URL is fixed it is also declared as constant. /// Test Class for invoking Web Service using WSInvoker assembly. In the Main() method the SOAP action URI indicates which web service method you want to invoke. In this example you will first invoke CurrencyRate() method and then the ProductPrice() method. To start define SOAP action URI for CurrencyRate() method and then create SOAP body. Note: The biggest advantage of this method is you can perform various operations like compression and encryption on SOAP body very easily. You can call your compression or encryption routine before creating complete SOAP message. Next the complete SOAP message is created using SOAP constants and SOAP body. Finally an instance of WSInvoker is created by passing web service URL and then SendSoapMessage() method is invoked by passing SOAP action URI and SOAP message. In similar fashion the ProductPrice method is called and output response is displayed on console. You can extend this application to send compressed or encrypted SOAP message to the web service. In such case you need to write SOAP handler at web service side to decompress and decrypt SOAP body. If web service is also sending compressed and/or encrypted message then you can write code to decompress/decrypt at client side. In this article you have seen how to invoke web service using direct HTTP post. This method is useful where traditional SOAP proxy is not useful or when you want to send encrypted/compressed SOAP body without using SOAP handler. The generic WSInvoker assembly can be used with any web service without need of proxy service.